The 26.21 metre motor yacht LaLouise, jointly listed for sale by Tom Barnes at bluewater and Hyde Yachts, has been sold with no other brokers involved. 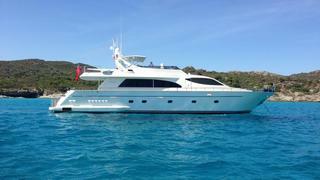 Built in GRP by Italian yard Falcon Yachts, LaLouise was delivered in 2008 as a Falcon 86 motor yacht. The previous owner had made extensive improvements since purchasing the yacht in 2012 including the installation of two Seakeeper Gyros 8000 series, giving her excellent stability both at anchor and under way. Eight guests are accommodated in four cabins consisting of a master suite, VIP suite and port and starboard twin cabins, all with en suite facilities. Overall she has a bright and airy interior with the use of light wood and neutral tones throughout. An expansive saloon has comfortable fabric settees, a Panasonic 42 inch television and an entertainment system featuring Bose surround sound. The dining area has a wine cellar and seating for eight guests around a large extendable table. Twin MTU 12V 2000 M93 engines power LaLouise to a cruising speed of 22 knots and a maximum speed of 28 knots. Lying in Antibes, LaLouise was asking €1.45 million.